/ Modified nov 23, 2016 9:42 a.m. There are no more planned translocations or lethal removal of mountain lions. A bighorn sheep emerges from an open gate after being transported from the Plomosa Mountains near Yuma to the Santa Catalina Mountains, Nov. 22, 2016. 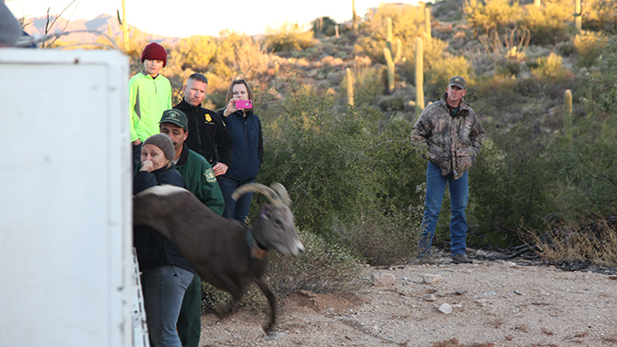 A crowd comprising mostly government and nonprofit wildlife officials, law enforcement and members of the media gathered at the base of the Santa Catalina Mountains Tuesday morning to watch 20 bighorn sheep clatter and shudder out of a trailer into their new home north of Tucson. 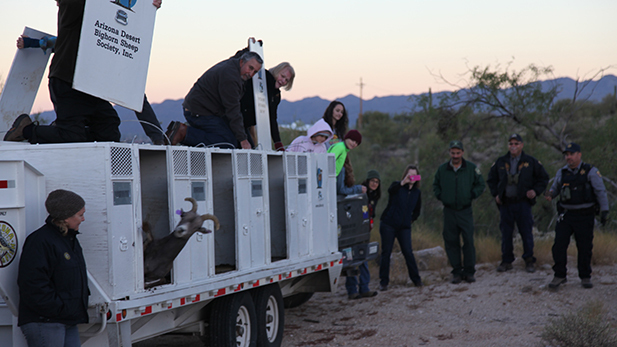 The 15 ewes and five rams were captured and brought from the Plomosa Mountains near Yuma and were the newest, and perhaps last, cohort of translocated sheep in the Santa Catalina Bighorn Sheep Restoration Project - an effort to re-establish a herd in the mountain range, where there was previously a native population, officials said. “This is kind of the culmination of a lot of work and a lot of effort, and a lot of excitement, really,” said Joe Sheehey, a member of the Catalina Bighorn Advisory Committee. Bighorn sheep dart off as they're released into the Santa Catalina Mountains, Nov. 22, 2016. Mark Hart of Arizona Game and Fish estimated the population after the release to be around 85, a number that has given those behind the project confidence to leave the bighorns to fend for themselves. That is not necessarily a prospect without trials, for the herd. “Of course, many things happen during the course of the sheep’s lifespan," Hart said. "We will lose some to mountain lions that we won’t track anymore. ... They’re very susceptible to respiratory problems like pneumonia. “But, at 85 they should be viable. They can sustain some losses, they can sustain some predation by mountain lions. We could lose a few to disease. Sometimes they suffer mishaps, a fall for example, as sure-footed as they are." 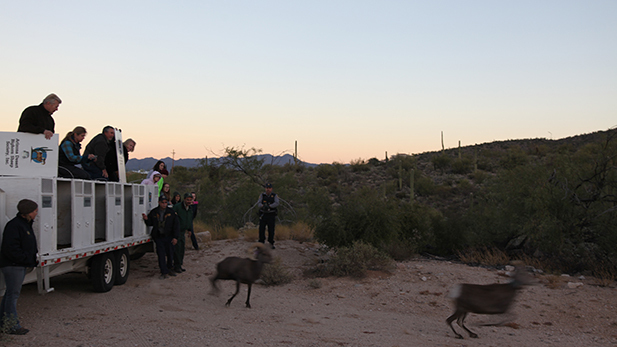 A bighorn sheep being translocated to the Santa Catalina Mountains finally leaps out of the trailer after coaxing from wildlife officials, Nov. 22, 2016. That danger from the mountain range’s big cats, and the response by the state, has sparked some controversy in past years, as the state would lethally remove mountain lions that preyed on the bighorns. The agency is phasing out that practice this year. “It was always designed to be a temporary measure to ensure the survival of the bighorns in the initial stages of the project,” Hart said. The project will take on a less active role for the time being, Hart said. 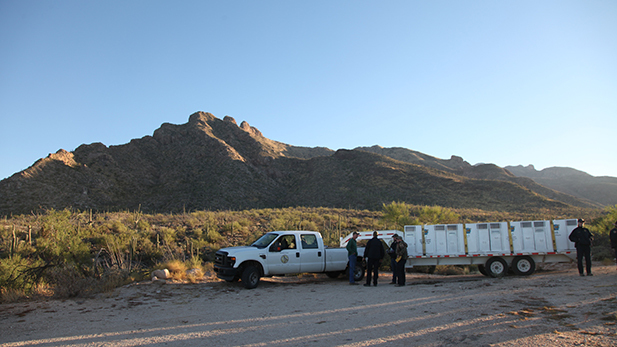 The location for the release of bighorn sheep in the Santa Catalina Mountains in an effort to re-establish a herd there, Nov. 22, 2016.